Ross Miner (SC of Boston) placed first in the Junior Men's Short Program with nearly a seven-point lead. 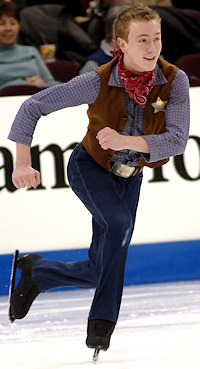 Earlier in the day, the Junior Men took to the ice with Ross Miner (SC of Boston) earning the top spot with a light-hearted performance to a Western-themed medley that had the crowd clapping along almost immediately. The colorful Miner (17) skated one of the only clean performances of the day, and takes a huge lead into the freeskate with 66.62 points. Miner leads the always-entertaining Keegan Messing (Anchorage FSC), a powerful spitfire of a skater, by a little less than seven points. Messing opened his program with a beautiful triple Axel, but made a mistake on his triple flip combination that likely cost him the lead. Close behind Messing is Junior Grand Prix Final silver medalist Armin Mahbanoozadeh (Washington FSC) with 59.29 points. Mahbanoozadeh opened strong with a triple flip-triple toe loop combination, but then popped his Lutz to take him out of contention for the lead. In fourth place is last year’s bronze medalist, Andrew Gonzales (All Year FSC) with 58.76 points, followed closely by Juran Yang (St. Paul FSC) who scored 58.37 points. Richard Dornbush (All Year FSC), one of the favorites heading into this competition, withdrew after the warm-up due to illness.